한양대학교 공과대학 글로벌 홍보대사 HISA (Hanyang College of Engineering International Student Ambassador)입니다! HISA는 한양공대 산하의 학생단체로 공과대학 소속 정규 외국인 유학생과의 교류 및 공과대학 외국인 유학생을 위한 문화 탐방, 기업 탐방, 선배와의 대화 등 다양한 프로그램을 기획하여 외국인 유학생들이 즐겁고 원활한 캠퍼스 라이프를 즐길 수 있도록 선발되었습니다. WELCOMING PARTY-HISA INFO NIGHT를 진행합니다. WELCOMING PARTY를 참석하셔서 식사와 함께 HISA를 소개하는 프로그램도 듣고 다양한 유학생 친구들을 만들 수 있는 기회를 놓치지 마시길 바랍니다! 타지에서 열심히 공부하며 노력하는 유학생 여러분들의 든든한 동반자 HISA가 되겠습니다. 참여를 원하실 경우 아래 링크에 접속하셔서 인적사항을 작성해 주시면 감사하겠습니다! We are HISA, Hanyang college of engineering International Student Ambassador. HISA is a student organization affiliated with Hanyang College of Engineering who designs various programs for foreign students to enjoy culture exploration, business exploration, and conversation with foreign students at the Engineering College. 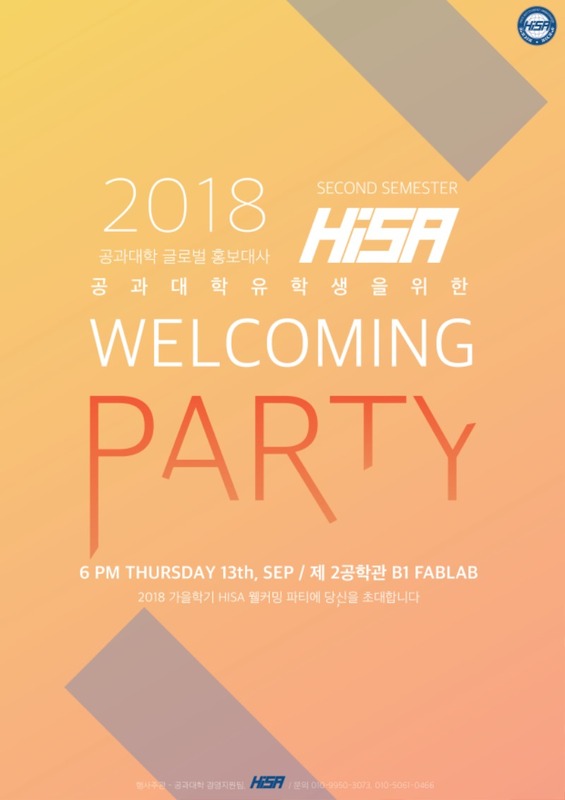 To celebrate the beginning of the second semester, HISA prepared a Welcoming Party-HISA Info Night for Engineering International Student with College of Engineering on THURSDAY, SEPTEMBER 13, at 6PM, at Engineering Building 2 B1F FAB LAB. Come and learn about our program for this semester and have a PARTY WITH US!! HISA would be very happy to be with you! if you are interested in joining us, please fill out the form link below, Thanks! 我们是汉阳大学工科学院国际宣传大使HISA(Hanyang College of Engineering International Student Ambassador)!